The SIIC began in the 1980s in Iran, under the name Supreme Council for the Islamic Revolution in Iraq (SCIRI). This party represents Shia Islamist political party, and The SIIC’s ideology supports Ayatollah Ruhollah Khomeini in Iran’s thinking that the Islamic Government should and must be controlled by Islamic scholars (called ULEMA). The sadrist movement is led by Muqtada al-Sadr. It is an Iraqi Islamist national movement that is supported by Iraqi Shi’a. The philosophy of the movement is religious in nature, organizing society by religious laws and tribal customs. In 2009 the Sadrists ran for election under the name “Independent Free Movement.” And in 2010 became a part of the National Iraqi Alliance, running for parliamentary election. Muqtada relates an anti-American sentiment in his speeches: In 2010 he motivated his fellow Iraqi-s to expel the US from Iraq. This party is led by Nouri al-maliki, prime minister from 2006 to 2014. Islamic Dawa Part is also called the Islamic Call Party; it was formed in 1957 by Shi’ite leaders. Although the Dawa Party similarly promotes an Islamic state, just as Supreme Islamic Iraqi Council does under Khomeini, al-Dawa has an important difference: Instead of the belief that power rests with the ULEMA, the Islamic scholars, it believes power belongs to the UMMAH, the people. The Dawa were anti-Saddam during his regime, and made attacks upon Saddam Hussein’s government during his reign, but never succeeded in assassinating him. 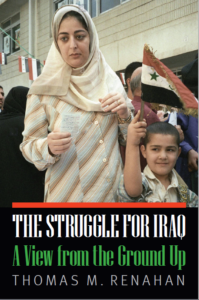 In January of 2005, the Dawa leader Ibrahim al-Jaafari became prime minster under the United Iraqi Alliance. Dawa’s headquarters lie in Nasiriyah, in the province of Dhi Qar. The Iraq Organization is a party which is a part of the United Iraqi Alliance. It became its own faction, splitting from the Islamic Dawa Party in the period of Saddam Hussein’s regime. It was elected to 12 seats/ positions in the Alliance after the 2005 elections. The secretary general is Hashim Al-Mosawy. The philosophy of the movement is again, Islamic, promoting Islamic ethics. It relates to the Dawa Part in its ideology in the fact that it believes in governance by UMMA, people.